Hubbard Alumni Post – Chicken Wire?! This post was written (and illustrated) by Evan Barrientos, one of our Hubbard Fellows back in 2015-2016. Evan now works for The Nature Conservancy in Oregon as a monitoring and outreach assistant. When I worked for The Nature Conservancy near Wood River, NE, I lived close to a restored wetland. In late winter I would gaze longingly out my window at the clouds of migrating waterfowl whirling above the calm water. I wanted to photograph this spectacle but approaching the skittish birds through the open prairie seemed an impossible task. Then I met Michael Forsberg, famed Nebraskan wildlife photographer. I learned how he builds blinds out of garden fence and grass and sleeps in them, sometimes for days, in order to capture the most intimate moments of nature and share them with the rest of us. I wanted to learn this art too, so I decided to try building my own blind on the restored wetland. The result was a successful comic adventure that for some reason I never shared on the Prairie Ecologist, until now. You could say I messed up from the start. The store was out of garden fence so I bought chicken wire instead, thinking it couldn’t be to different. It could. I spent most of the next afternoon pounding stakes; cutting wire, camo cloth, and grass; and zip tying it all together in the rough shape of a burrito with a hole at one end and a window at the other. The blind was placed right on the water’s edge and would have a spectacular view of ducks waking up in the golden light of sunrise. Or so I thought. After leaving the blind out for two weeks to let the birds acclimate to it, I set out one March night with my camera gear and sleeping bag, crawled into the blind, and fell asleep to the quite murmurs of roosting mallards. I was so eager for sunrise that I had no less than five dreams of waking up in the blind. In one dream I woke up underwater. In another I woke up to find the wetland dry. When I finally did wake up, I discovered a snafu that I hadn’t even dreamt of: the blind had collapsed on me. The chicken wire couldn’t support the added weight of the morning dew, and in order for me to see out the blind’s window I had to prop the damn thing up with my head. In addition to being extremely uncomfortable, I worried that the floppy and occasionally cursing blob would scare away the birds. Fortunately, it did not. Maybe the birds thought it was too pathetic to be man-made, or maybe it looked like a decomposing tree trunk, but they didn’t seem to notice me at all. I knew I was okay when a Red-winged Blackbird strolled across the top of my head. Viewed head-on, you can see how a Great Blue Heron’s head is adapted for a lifestyle of hunting prey directly below it. It amazes me how this bird’s appearance changes from Jurrasic to cartoonish with a slight adjustment. Pathetic as it was, I’m grateful to the blind for giving me intimate glimpses into the lives of birds that I never would have had otherwise. It’s not often you get to see wild animals behave truly naturally, not at all concerned about a human watching them. Watching a goose bathe in the golden light of sunrise, hearing Blue-winged Teal drakes whisper soft calls to an attractive female, watching beads of water drip from a Gadwall’s impermeable feathers; these were new and beautiful experiences for me. Thanks to the blind, I saw familiar birds in an entirely new way. 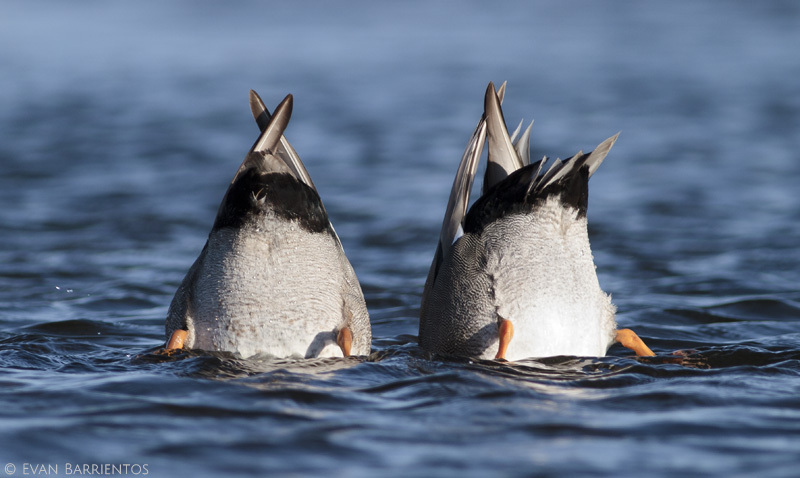 Gadwall drakes reveal their surprisingly vivid legs while foraging in the classic dabbler form. 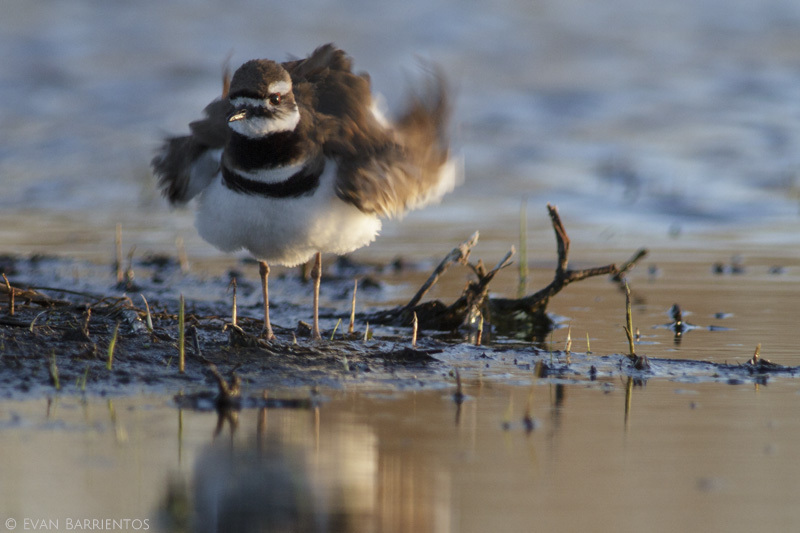 A Killdeer ruffles her feathers after preening in front of me. 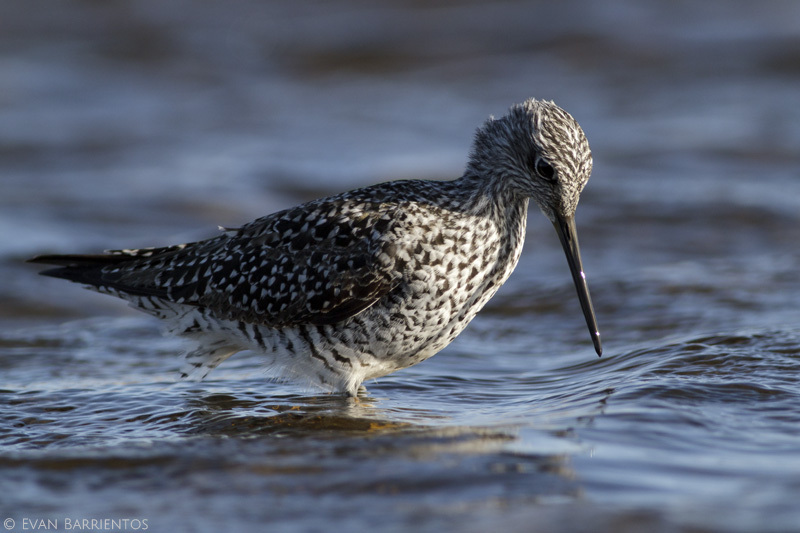 A Greater Yellowlegs scans the water for invertebrates. This was the closest I’ve ever been to one. Pathetic as it was, I’m grateful to that blind for giving me glimpses into the lives of birds that I never would have had otherwise. It taught me a new way to appreciate wildlife, one that requires you to become a part of the landscape. Hunters and photographers know the value of extreme patience, but in today’s fast-paced society, rarely does the average person sit in a spot for hours and watch nature’s secrets reveal themselves. A blind, I learned, teaches you that patience and provides a window to a new view of nature. I hope to build many more blinds in the future, but never, ever again out of chicken wire. This entry was posted in Hubbard Fellowship, Prairie Animals, Prairie Photography and tagged Blind, Ducks, Great Blue Heron, migration, photography, shorebirds, spring, Waterfowl, wildlife by Evan Barrientos. Bookmark the permalink. Interesting experience, Evan — thanks for sharing! Lovely, funny, serious (the patience part) essay, Evan. By the way, I’m no expert on shorebirds, but I think the one in your picture is in fact a lesser yellowlegs. Maybe someone who really knows birds confirm or correct. . . Thanks James. Yea, I was unsure about the ID. The beak looks more like a Lesser, but the flanks seemed more streaked like a Greater. Anyone else have thoughts? Great post, Evan! We can all use a bit of levity these days. Lesson learned. Wonderful shots, regardless. Thanks for sharing. What a marvelous post. Thank you. And the pictures were worth it!